There is no secret that throughout the history of General Motors that racing has been a core of their success, with the Chevrolet Division in particular. Before Louis Chevrolet himself ever established the Chevrolet Motor Car Company in 1911, he was a race car driver. Fast forward nearly 100 years, and Jimmie Johnson just became the first five-time-in-a-row NASCAR Sprint Cup Champion while driving a Chevy-powered stock car. Over the last 70 years however, GM has had an on-again, off-again, and on-again relationship in their support of organized racing. There has never been a time throughout GM’s history that their products really had no involvement in racing, but there was a time when GM Corporate was officially “out of the game,” at least from a factory support standpoint. This resulted in a number of dominoes that fell in the time line that created a number of items we now take for granted, including the concept of the crate engine and perhaps even GM Performance Parts! In this article we’ll take a look back at the last 70 years of GM’s factory racing involvement and attempt to connect the dots. By the early 1950’s it was becoming clear the the automobile was a solid part of American culture. World War II had come and gone, and the Greatest Generation was in full swing of creating a burgeoning middle class. Men were racing cars for competition and thrill, and racing series of all kinds across the country were taking hold. The “Big Three” Detroit auto manufacturers were all involved in backing racing in one form or another. In 1955, during the 24 Hours of Le Mans, a catastrophic accident where a Mercedes 300SLR exploded and careened into the crowd killing 83 spectators (injuring dozens more) caused a major stir among auto manufacturers and in 1957 the Automobile Manufacturers Association. Made up of members that represented all American auto makes, the AMA formed a gentleman’s agreement to back out of organized auto racing and motorsports of any kind. Some in the industry felt this was a method that would prevent Congressional involvement that might force the auto makers hand in some other more unwanted way. 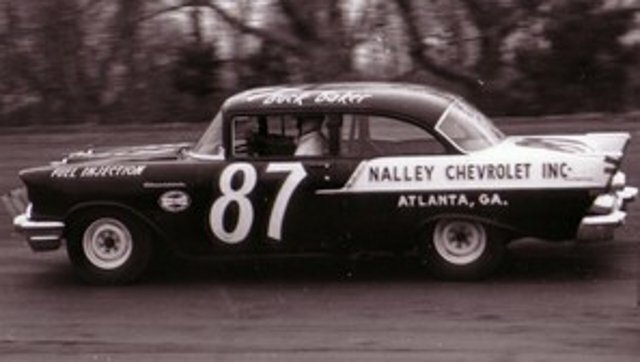 Buck Baker and his 1957 Chevy Black Widow. Racing is a fickle thing though, and as soon as the gentleman’s agreement was made it was already being circumvented by manufacturers. GM was no exception. The 1957 “Black Widow” was a perfect example of a way to create a factory race car without factory support. GM brought former Hudson lead race engineer Vince Piggins into the company and sent him to Atlanta where he created SEDCO, the Southern Engineering and Development Co.
Jim Wangers driving a Catalina Coupe at the 1960 NHRA Nationals in Detroit. Image: Jim Wangers. Piggins had SEDCO create the first Black Widow for racing competition, and each step of the creation was documented in cook book fashion so that others could produce the same car on their own . The car was not based on the top of the line Bel Air coupe, but instead the cheap and rugged One-Fifty Utility Sedan. It featured the famous 283 cubic inch, 283-horsepower fuel injected engine, a three-speed manual transmission, six-lug wheels, a 20-gallon gas tank, and numerous other race inspired changes. SEDCO issued the “1957 Chevrolet Stock Car Competition Guide,” which documented the step-by-step instructions required to build each car, including the 170 individual GM parts that would be necessary. The Guide was mailed to over 400 Chevy dealers and the legend of the Black Widow was born. With no official factory support the Black Widow Chevy’s campaigned all season long, with Buck Baker winning the championship. Around the same time as the gentleman’s agreement, the Pontiac Division was undergoing a massive image change under it’s new director, Bunky Knudsen. Bunky’s task was to improve Pontiac sales, and to do so he knew that he’d need to change Pontiac’s “ho-hum” image into something far more appealing. He also knew that racing and styling would be the ticket, and despite the AMA gentleman’s agreement he pushed Pontiac forward into support for factory backed racing. Junior Johnson's winning 1959 Chevy running in the 1960 Daytona 500. Junior Johnson claimed his only Daytona 500 victory as a driver in the 1960 running of the race while driving a 1959 Chevy. He stated that when compared to the Pontiac’s his Chevy was so slow that it couldn’t compete. In some sessions he was nearly 30mph slower in his Chevy that the superior Pontiac’s. How did he go on to win the race, then? In a 2009 podcast interview with ClassicPontiacMuscle.com, Jim Wangers, the marketing Godfather of the GTO, told the story of Pontiac’s relationship with racing and with GM Corporate. Jim witnessed events first hand, and he also noted that perhaps the AMA had some ulterior motives in supporting the gentleman’s agreement to a racing ban. Corvettes continued racing internationally, helping cultivate a worldwide presence, as seen here chasing Mauro Bianchi in Daytona 1963. Although Chevrolet was officially out of the professional racing game, enthusiasts and privateers continued using brands like Chevrolet and Pontiac faithfully. “The gentleman’s agreement did not really end until 1963 when Chevrolet returned with the mystery motor, their porcupine head big block engine. Chrysler jumped in with their HEMI, Ford brought in a new V8, and all manufacturers became competitive,” Wangers remembered. “By 1961 and 1962 GM was getting roughly 53% of the entire U.S. auto industry sales and the U.S. Justice Dept became interested. They were watching GM, and should GM get close to 60% they would consider breaking GM up. The precedent had already been set with Standard Oil years earlier, and their threat to GM had realism. GM thought that one of the ways they could cut that growth was to stop actively participating in motorsports and to cut their dollars there,” Wangers concluded. The NHRA said, “We can’t really let you run those cars since they had a class called ‘Super Stock,’ which was the best ‘stock’ factory class available.” Since you could not buy that car in the factory showroom the NHRA created the F/X class (for Factory Experimental) where Chevy’s and Pontiac’s could run. After 1963, GM’s efforts in factory backed racing stopped, hurting those teams hardest who solely depended on GM’s support. It would not be the complete end of GM’s participation in racing, however. By 1967 Trans Am racing was going in full bloom, and GM management was looking to find a way to develop and manage speed parts that would go out to the various teams. Though no one realized it at the time, a 27 year-old named Ernie Callard was tapped to head up the beginning of what is modern day GM Performance Parts. He was to provide a way for Trans Am teams to get their high performance GM parts in an organized fashion, somehow, some way. He was also told under no circumstances should he ever run out of parts for the teams, even if he had to throw excess parts into the Detroit River! Initially the parts were not to be tracked internally and would have no part number. One could assume that this may have had something to do with GM’s Official ban on racing involvement, but that would be speculation only. Callard proposed that the parts should instead be identified with an official part number, and that the parts be made available to the public for anyone to purchase directly from GM along with racing teams. Wham! 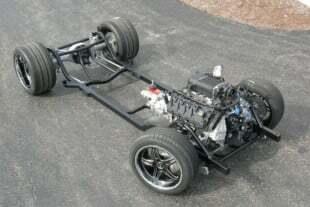 The groundwork for GM Performance Parts had just been laid! Glory Days. 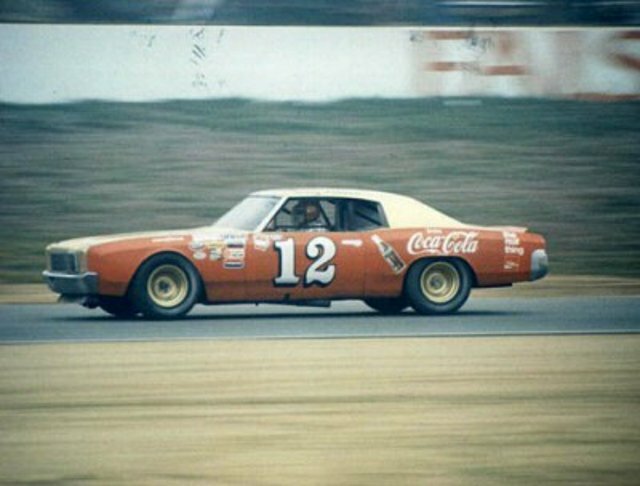 Bobby Allison's 1972 Monte Carlo. GM agreed, and Callard put into place the configuration, distribution, and packaging system that became the cornerstone for the purchase of high performance parts directly from GM. Initially his parts catalog was to focus solely on Corvette components, but it didn’t take long for word to spread of the program and soon people were buying up factory speed parts like crazy for their Corvette’s, Nova, Chevelle’s, Camaro’s, etc. When Chevrolet released the Central Office Production Order (COPO) program for the Camaro in 1969 it allowed a special order to be made by consumers and dealers to obtain an iron block 427 cid/ 425 horsepower engine to come in the car. The all aluminum version of this engine was the legendary ZL1, and Callard was able to crate up surplus ZL1 engines and sell them directly through GM Performance Parts. It was the beginning of the modern day crate engine! As a result, performance oriented dealers such as Yenko, Dana, and Nickey snatched up COPO cars and crate engines and created some of the most legendary and sought after muscle cars ever created. In 1970 something else happened that would change the way GM’s involvement in racing would work when GM decided to get back into NASCAR. While there seems to be no clear information stating that the GM Corporate ban on racing was lifted, it was certainly relaxed, and GM would re-engage NASCAR racing in the same way it did with Trans Am; through GM Performance Parts. The Professor of Pro Stock, Warren Johnson. Callard was to support each NASCAR team with parts, and in turn had a Chevy dealer for each team that handled their parts distribution. Chevrolet engineers actually did start to produce racing parts and also produced a guide called the “Sheetmetal Book” that was a catalog of all production body panels that were regularly mangled in racing. Callard’s involvement with NASCAR teams was direct, and the evolution of involvement grew into what today is modern GM Racing support. Today GM Racing and GM Performance parts are thriving results of Chevrolet’s factory involvement in racing with support for the hobbyist and weekend racer all the way up to Sprint Cup, NHRA, Corvette Racing, and the like. It is no accident that a weekend racer can buy a “sealed” crate motor directly from GM and race to his heart’s content; it’s merely an evolution of the on-again, off-again, and on-again process that has occurred with GM’s involvement in factory backed racing.